» Baylor is in talks to open the 2016 season in Australia, and would likely face a Pac-12 opponent. » Less than two years after leaving Arizona State, Texas athletic director Steve Patterson has already made enemies in Austin. » Former Arizona forward Rondae Hollis-Jefferson is sponsoring a bus to take 40 kids from his hometown to next week’s NBA Draft. Three UCLA players received spots on Phil Steele’s preseason All-American teams, the annual list released on Monday morning. Linebacker Myles Jack earned a second-team nod, while nose tackle Kenny Clark and center Jake Brendel made the fourth team. Jack and Clark are the Bruins’ two most talented defensive players, and both are likely bound for the NFL draft after their junior seasons. Brendel, a redshirt senior, is a fourth-year starter who has played in 39 of 40 possible games. Six Bruins landed on Steele’s preseason All-Pac-12 first team, although Brendel settled for a second-team spot behind USC center Max Tuerk — a preseason first-team All-American. In addition to Jack and Clark, the first team included receiver Jordan Payton, offensive tackle Caleb Benenoch, defensive lineman Eddie Vanderdoes, and cornerback Fabian Moreau. The most notable absence on the list is left tackle Conor McDermott. The 6-foot-9 lineman started the last seven games of the 2014 season, and projects to be the most important player on the offensive line besides Brendel. 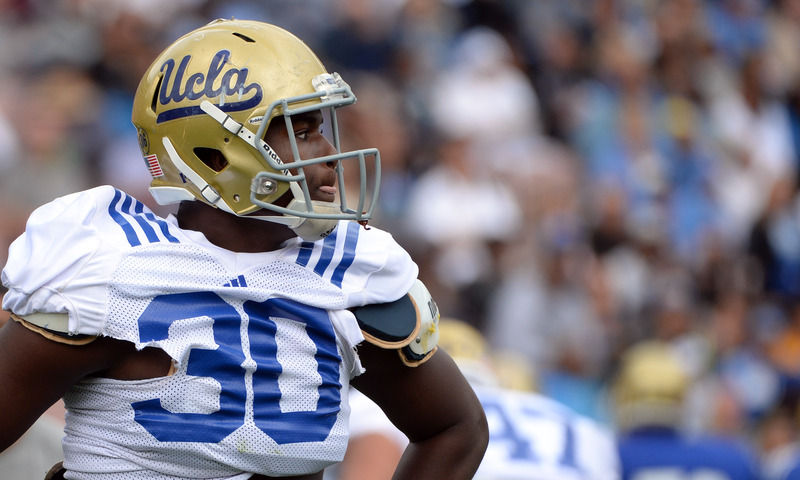 Is UCLA’s best offensive player … Malcolm Bunche? Maybe in the wonky world of preseason all-conference teams. College football writer Phil Steele released his All-Pac-12 selections today, going four lineups deep on offense, defense, and special teams. Seven Bruins made the four offensive teams, but the one ahead of them was arguably the strangest pick in the entire list. Bunche is no doubt an important piece of UCLA’s offensive line this upcoming season, but he transferred from Miami in the first place because he lost playing time. It’s also unclear whether the 6-foot-7 lineman is best suited at guard at tackle, though he practiced more at the former in spring. In the mood for a round of meaningless-but-encouraging awards? Have some midseason All-Pac-12 team mentions, courtesy of college football guru Phil Steele. Steele named eight UCLA players to his all-conference squads, with outside linebacker Anthony Barr and left guard Xavier Su’a-Filo leading the way on the first team. The pair also landed on Steele’s midseason All-American team, with Barr earning a first-team nod and Su’a-Filo a second. Center Jake Brendel and linebacker Eric Kendricks both made the midseason second team. Receiver Shaq Evans and running back Steve Manfro joined the pair there, but earned their spots for contributions at kick and punt return. Quarterback Brett Hundley ended up on the third team, behind Oregon’s Marcus Mariota and Oregon State’s Sean Mannion. Defensive end Cassius Marsh rounded out the UCLA names on the list. Phil Steele named both UCLA linebacker Anthony Barr and offensive lineman Xavier Su’a-Filo as preseason All-Americans. The standouts were first- and third-team selections, respectively. The Pac-12 landed 20 players on the list, second behind the SEC’s 27. Steele also ranks (snubs?) UCLA No. 31 nationally on his preseason countdown — behind Washington, Oregon State and Arizona State.